Three of my favourite things combined into one outfit. This has to be one of my favourite outfits ever! It has leather -well, pleather to be honest- suede -that one is real- and leopard print. 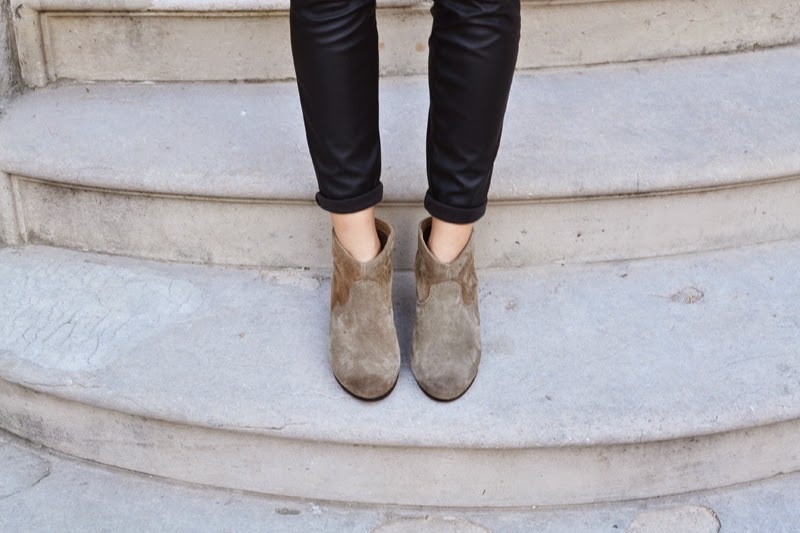 I was so happy I found these lovely boots at the Mango outlet, here in Barcelona. I've been looking for beige booties for so long now and finally, my patience paid off. Oh by the way, did you guys see my nomination coming by? I've been nominated by Weekend for the Weekend Blog Awards and I would really appreciate your vote! Just go to this website and chose your favourite blogger in every category. Make sure you fill in your email in the end so the vote counts. Thanks a million!! Ph by Karolina from Karusky. Dat vest/jas is echt mooi!